One of my frugal meal planning strategies that I use every single week in my own home and in my Healthy Budget Meal Plans is to use balance. I have written an entire article on this, but the premise is to balance pricier meals in the week with dirt cheap meals later in the week. Can families on a budget never eat shrimp, fish, or pricier cuts of meat? Not in my experience. 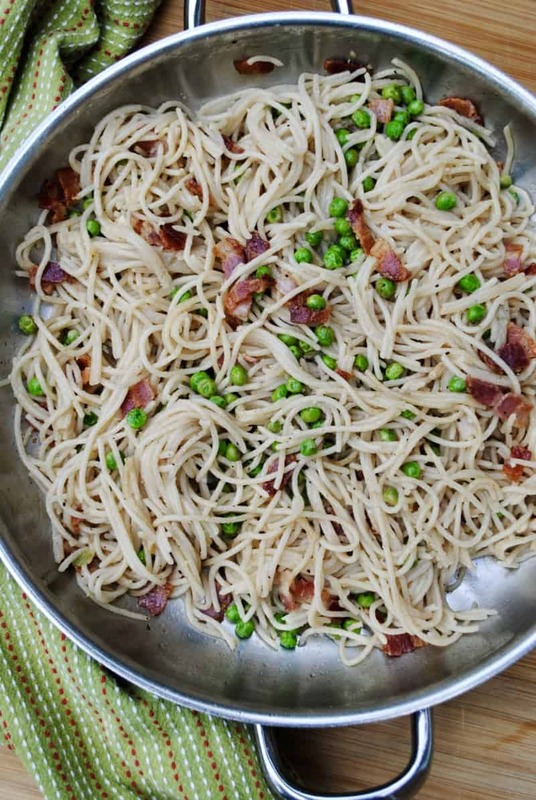 Most families on a budget can still eat pricier items sometimes as long as it is counter balanced with a less expensive meal in the same week like this pasta with bacon and peas. Meatless or low-meat simple soups and pasta dishes are excellent choices for the dirt cheap menu item for the week because pasta are broth are both inexpensive, filling, and stretch a long way. Regular wheat based pasta can be found for $1.00/box. 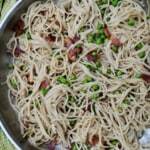 Even if using a more expensive gluten-free pasta, like I do in my own home, this pasta with bacon and peas is still low cost and delicious! Anytime you mix pasta with bacon, it’s going to be yummy in my opinion. The frozen peas used in this dish are something that I always keep stocked in my freezer for a quick side dish or to add into fried rice, soups, etc. I am a huge advocate for keeping frugal versatile items stocked in your pantry, fridge, and freezer, and you can’t beat the price and versatility of a bag of frozen peas. 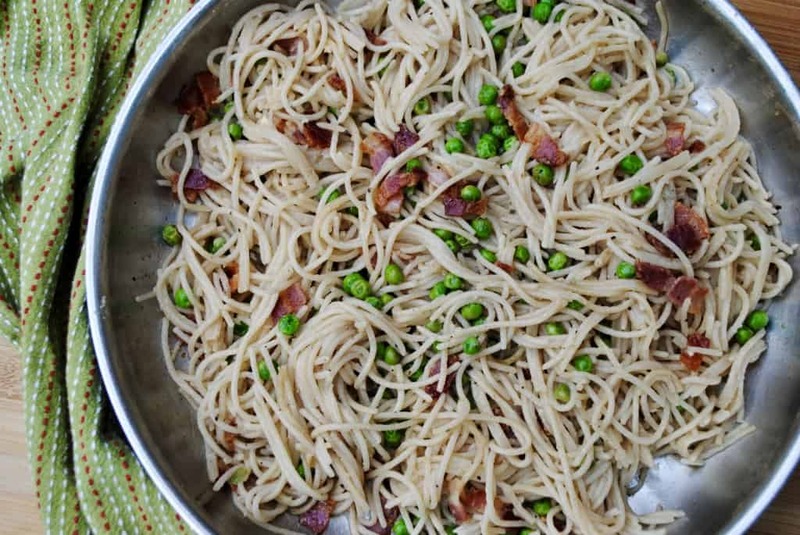 If you are trying to squeeze more veggies into your diet, which I always recommend, pair this pasta with bacon and peas with a simple salad for an easy weeknight meal. Don’t forget the homemade salad dressing for further cost savings. An inexpensive delicious weeknight pasta dish. Cook pasta according to package directions. Make sure to liberally salt pasta water. In a separate skillet, cook bacon until crisp on medium low heat. Add peas, garlic, salt, and pepper and cook for a couple of minutes taking care not to burn garlic. Drain pasta, add to bacon and pea mixture, and toss with lemon juice and a drizzle of olive oil. If you can tolerate dairy, it is excellent topped with grated parmesan cheese. Taste and adjust salt and pepper if needed. I think you will love this easy weeknight dinner. If you ever make one of my dishes and post online, use the hashtag #eatwellspendsmart on Instagram and Facebook. I’d love to see what you’re making. Happy cooking!